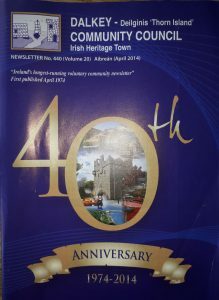 First published in 1974, the Dalkey Community Council newsletter holds the record for the longest running, voluntary community-based free publication in Ireland. The newsletter is treasured by locals as an invaluable source for local news and issues as well as local business tradespeople. The newsletter includes a summary of the latest Dalkey Community Council meeting, updates from Dalkey Heritage Centre and Dalkey Tidy Towns, local planning applications, news from local churches, local history, schools, drama societies and sports clubs and forthcoming events. In addition there are regular columns such as ‘My Garden’ by Philippa Thomas, ‘Maritime Dalkey’ by Jehan Ashmore and ‘Nature Corner’ by Michael Ryan.